Thanks for sharing this useful information here. I want to know about the specifications of your wattmeter? 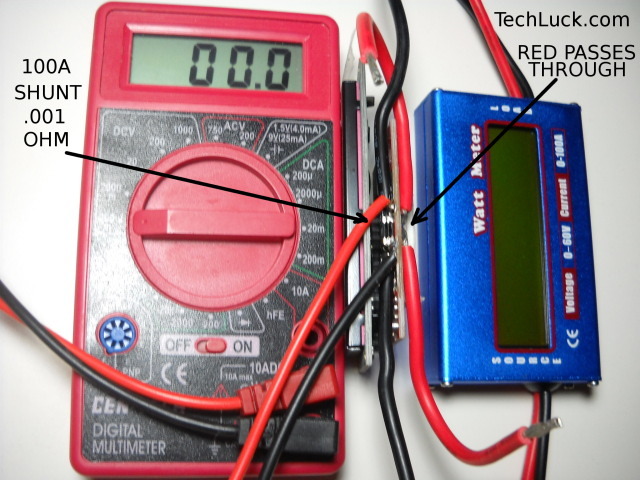 What is there inside due to which it is possible to measure the power by connecting it with the multimeter? These little DC Watt Meters are about $15 on ebay. They work well but if you ever go over 60V, even a short spike, you will blow them so beware, such as putting them on the solar panel side of your system, lots of on and off pulses going on there and it can spike over 60V. But if you do blow one, it still has a 100A shunt in it and can still be used with a free (with coupon - search Google) Harbor Freight Volt Meter set to the 200 mV setting. Also on these meters the RED wire is a feed through and really is there just to power the meter, so you can hook that to a switch and reset the figures it collects, while running another straight RED wire for your circuit. Meaning (+) doesn't have to go through that meter, it senses the amps on the (-) side only.